If you're familiar with my blog, you know that pictured below is the Tiny Tornado. What a wild chase we had around the train station. This photo captured the 3.5 seconds she was at rest. Great shot, love it in b&w. The lighting perfectly fits the mood... the calm in the eye of the storm. I love the repeating lines all over the background too. OH so precious!!! 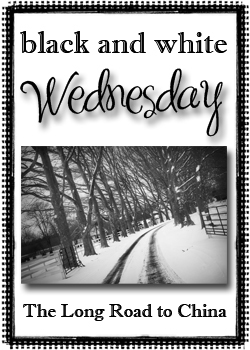 I absolutely LOVE it in Black and White! LOVE IT! Karli, what a great shot. I love that it tells some type of story. once your blog popped up I was taken back by the beauty! love it! Love this!! I think you captured the ART that you were seeking! Well done friend. So cute! This photo looks beautiful in black and white! Beautiful!! 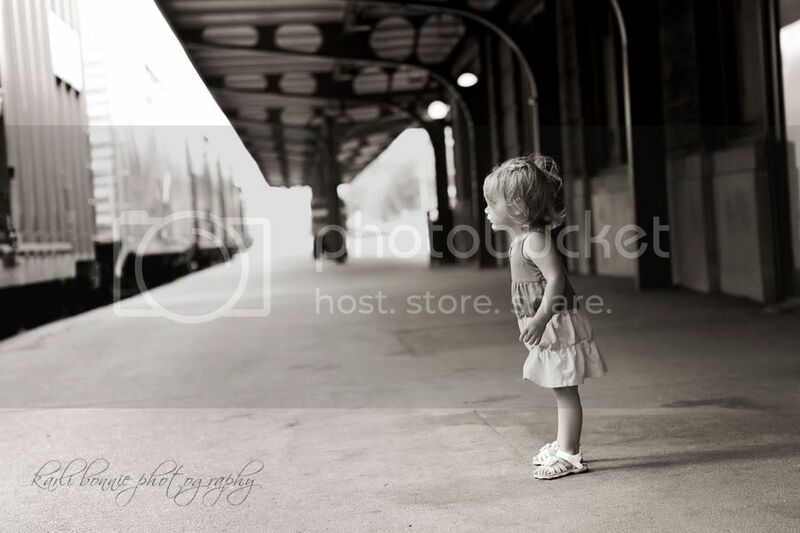 She looks like she's completely mesmerized by the train. You take such beautiful photos and edit them to make them even more stunning! I wish I had your talent! Thank you for sharing. I love everything about this, the perspective, the composition, the coloring...perfect! love how little she looks compared to the big station!! Oh my goodness!! That is so adorable! L.O.V.E it in B&W!! Love seeing snaps of that gorgeous girl. Yes!! IT is the desert dome.. IT is the one landmark my kids can find anywhere in Omaha! LOL. I would have never guessed that we would have so much fun living in Omaha.. but I am ready to head back south... Before the snow flies. LAst winter about killed me! Beautiful! You can really see how full of life she is. Ok, those colorful train cars were great, but this is SO AWESOME in b&w!! Such scrumptious lighting! Your photos are all amazing but this one is my fav I just love it!!! She is a doll and this is such a great shot. Very nice! I seriously LOVE this shot. Can I just follow you around and take notes. You're my hero. See...I'm not always sarcastic. Wow! You got a WHOLE 3.5 seconds? You lucky duck! I swear I can actually see energy swirling around her for those 3.5 seconds. LOVE this photo!